I started roasting turkeys shortly after I got married in 1982. I initially learned how to roast them in a traditional manner from my mom and my wife’s Aunt Elsie. It was a great combination of old school European (mom) and southern country (Aunt Elsie). Over the years I stayed pretty true to tradition, but I spent a lot of time working to find the best way to achieve moist breast meat with fully cooked thighs. When I started egging around 2000, I started the quest for the best possible roasted turkey on the Big Green Egg. I wanted to create that traditional roasted texture with just a hint of smoke flavor, not a smoked turkey. With the attributes of the moisture retention properties of the ceramic cooker, along with the rustic flavor of cooking over charcoal, I was able to achieve a great tasting, moist turkey. Over the years I have continued to tweak the method, always striving for great flavor and moistness. Now with the advent of Mad Max Turkey Seasoning, we have taken the traditional holiday turkey to a whole new level. Myself, along with Chris Capell and the whole Dizzy Pig team, hope that you enjoy the results. Ok, here’s how I do it, but first a couple of disclaimers. One, I don’t brine my turkey. As I’ve state before, there is no particularly good reason for this other than I’m too lazy to do it, or I don’t think about it in advance. Plus, I’m not sure I could find the refrigerator space for the container it would take. However, this should have no impact on if you want to brine and still follow the rest of my method/recipe. Second, while this method will usually result in fairly crisp skin, it is not my focus, however, it will look great as far as the final presentation. My goal is a turkey where the breast is done at the same time as the legs (more on that later), the meat has a great flavor, and there are drippings that will make for the best gravy you ever ate (after all, how many times have you had good turkey but crummy or pedestrian gravy?). And, when the gravy is really good, you will make a really memorable impression on your guests. This is a very traditional turkey that benefits from the magic of the egg. All of this in my most humble of opinions, of course. Clean turkey. Put neck, heart, giblets, liver, and fat into a large pot. Add a halved onion, couple of stalks celery, some carrots, and 2-3 tablespoons of the Mad Max Turkey Seasoning. Fill the pot to the top with water and let it simmer all day. This will be your stock for making the gravy. Let this simmer all day long, adding water occasionally to keep the level up. This will make your house smell great, and create a wonderful rich stock for the gravy. Pat turkey dry, and season the cavity with Mad Max Turkey Seasoning fairly liberally. Stick one halved onion, half a quartered apple, and halved lemon into the cavity. Mix 2 Tbsp Mad Max Turkey Seasoning with butter, until it’s a nice paste. Put turkey in the roasting pan, breast up and elevated (such as on a v-rack or, in my case, I have a trivet-like metal piece that raises the turkey about 1″ above the pan. Add two apple quarters to the roasting pan. Important:Before roasting the turkey in the egg (or oven), lay a gallon zip-lock bag full of ice cubes over the breasts for 20-30 minutes. This lowers the temperature of the breast sufficiently that over the course of the roasting, the breast will be done at the same time as the thighs. Over the years (and I’ve been doing the Thanksgiving turkey now for over 30 years), I’ve tried every trick in the book (paper bags, breast side down, terry cloth towels over the breast, etc.) and the ice bag absolutely works. I’ve been doing this now for about 20 years, and I’ve consistently had perfectly done, moist breasts finished right along with well cooked thighs. If you don’t do anything else, try this. Remove the bag of ice just before putting it in the egg. Important:Prior to roasting, liberally apply the paste mixture all over the turkey. You can work some under the skin if you want to, but it’s not necessary. Cook turkey at 325°F, and baste every 20-30 minutes after the first hour. My turkey weighed in at around 14 pounds. At 325°F, it took a good 4 hours to be done. There’s no need to check the bird’s temperature until the last hour or two. If using a water pan for a heat barrier (underneath the roasting pan), regularly check to ensure it stays full of water. Tent turkey loosely with foil once the skin starts to brown, until the last hour. Remove foil to let the skin crisp up into a deep, golden brown. Pull the turkey out when a deep poke in the thigh and breast results in clear juices, and the drumstick rotates freely at the joint. Very important: When removing the turkey from the roasting pan, tilt the turkey up so that all the juices in the cavity pour into the pan (you do NOT want to lose this). Set turkey aside on a cutting board or platter and cover in foil until ready to carve, and discard the apple. Take pan with drippings in it and pour into a bowl or large measuring cup. In this case, I’ve gotten about 2 full cups of liquid from the pan. Note that the dark stuff you see is not burnt. It is well browned and will affect the final color of your gravy. This is where all the real flavor is. The color of the drippings will determine how dark your gravy will be. Sometimes it’s lighter, sometimes darker. It will be fantastic either way. Let sit for about 5 minutes so that the fat separates from the good drippings. Gently remove the fat with a ladle, but do NOT throw away the dark pan juices. The dark parts are not burnt and are where the real flavor is. Now, you are really ready to make the gravy. Place pan over burner (in this case both front and back burners) on high heat and add butter (or if you have enough turkey fat from the pan, use it for an even richer gravy). Whisk hard to pull up as much of the “fond” as possible. Whisk constantly to avoid burning or scorching (fond should be bubbly and brown). Adding flour in equal amounts to the butter/fat (anywhere from ½ to 1 cup), whisking it in until it’s a bubbly, pasty texture. Keep whisking until you have a thick, smooth roux, with no lumps of flour, about 4 – 5 minutes. Add reserved wine to the roux. The pan should still be on a high flame so the alcohol boils off quickly. Keep whisking. The key to a nice smooth lump free gravy is to whisk the roux until it’s lump free and then keep whisking the other ingredients in so that it stays nice and smooth. Because of the high heat, it will be constantly bubbling, this is why you have to keep whisking, so it doesn’t scorch or burn. Once the roux has been reduced about 1/4 to 1/3, add in the liquid saved from the pan. This is the true key to the gravy, it imparts so much great flavor. Ladle the stock that has been cooking all day into the pan, one ladle at a time, continuing to whisk it in. Bring pan to a boil. Keep adding stock until you have the desired thickness. Add a little extra Mad Max Turkey Seasoning to set the final layer of flavor. Take neck, giblets, heart and liver from the stock pot, and remove the meat from the neck (you’ll be amazed how much meat there is). Chop it all up very finely and add it to the gravy. In a small bowl, mix some of the stock with some flour to create a thickening agent. By doing this in a separate bowl, you avoid creating lumps in the gravy. If the gravy is too thin, add some of this thickening agent until you get the consistency you want. If it is too thick, add more stock. Final Note: This gravy will not look like the creamy stuff from a jar, nor is it intended to, but I’ll bet it’s the best you ever had. ***I typically start with a fresh killed bird from the grocery, not necessarily organic or free range, but one which hasn’t been frozen like a rock for a year. First, remember when you cleaned out the turkey and took out the neck, heart, giblets, liver, heart and that lump of fat? Put these into a large pot. Add a halved onion, couple of stalks of celery, some carrots, and 2 to three tablespoons of the Mad Max Turkey Seasoning. Fill the pot to the top with water and let it simmer all day. This will be your stock for making the gravy. Let this simmer all day long, adding water occasionally to keep the level up. Pat the bird dry, season the cavity with Mad Max Turkey Seasoning fairly liberally. Into the cavity stick one small onion (halved), one half apple (quartered), and one lemon (halved). Take two sticks of butter, softened. Take two tablespoons of the Mad Max Turkey Seasoning and mix it into the butter ’til you have a nice paste. Put the bird in a roasting pan, breast up, elevated either on a v-rack or in my case I have a trivet like metal piece that raises the bird about 1 inch above the pan. Take the other two apple quarters and throw it directly in the roasting pan around the bird. Important step one: 20 to 30 minutes before you put it in the egg (or oven), take a one gallon zip lock bag full of ice cubes and lay it over the breasts for the 20 to 30 minutes. Remove the bag of ice just before putting it in the egg. Important step two: Last steps prior to putting the bird in the egg (or oven), take your Mad Max Turkey Seasoning and butter paste and liberally apply it all over the bird. You can work some under the skin if you want to, but its not necessary. Set up of inverted plate setter with the little green BGE ‘feet” on top, and the roasting pan on top of the feet. Key here is to have a heat barrier and sufficient air flow under your roasting pan to avoid any scorching in the pan. I set up as full a load of lump as I could (almost to the top of the fire ring, there was maybe a 1 inch gap between the lump and the bottom of my plate setter). I got a good established fire going at 325°F. After the second hour and basting. … and the thigh (168°F). VERY IMPORTANT: When you pull the roasting pan and turkey from the egg and you’re removing the turkey from the roasting pan, first tilt the bird up so that all the juices in the cavity pour out into the pan (you do NOT want to lose this). Here is what your pan will look like, with the all the dripping in it. Note, that dark stuff you see is not burnt. It is well browned and will affect the final color of your gravy, but trust me, this is where all the real flavor is. Now, pour the contents of this pan into a bowl or large measuring cup. In this case, I’ve gotten about 2 full cups of liquid from the pan. Let it sit for about 5 minutes so that the fat separates from the good drippings. Add two sticks of butter (or if you have enough turkey fat from the pan use it for even a richer gravy) and whisk it hard, pulling up as much of the pan crud (aka fond) as possible. Now start adding flour (anywhere from ½ to 1 cup) in equal amounts to the butter/fat. Keep whisking and working it in ’til it’s a bubbly, pasty texture. After about 4 – 5 minutes it should be thick and smooth. Now, add the wine (you did save it didn’t you?) to the roux in the roasting pan. You should still have it on a high flame, so the alcohol will boil off quickly. Once the wine has been mixed in, and reduced about ¼ to 1/3, add in the liquid you saved earlier. This is the true key to the gravy, it imparts so much great flavor. Start ladling that stock you’ve been cooking all day into the pan, one ladle at a time, continuing to whisk it in. Keep the heat on, bring it all to a boil. Keep adding stock ’til you have the desired thickness. 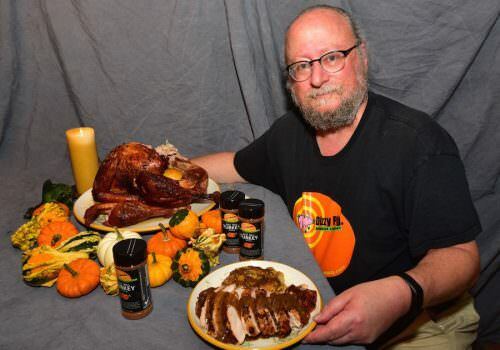 Now is the time to add a little extra Mad Max Turkey Seasoning to get the final layer of flavor set. The big finish. Now, take the neck, giblets, heart and liver from the stock pot. Remove the meat from the neck (you’ll be amazed how much meat there is). Chop it all up (meat, giblets, heart and liver) very finely and add it to the gravy. Adjust thickness to your liking. Too thin? add flour to thicken. Too thick? Simply add some more stock. This gravy will not look like the creamy stuff from a jar, nor is it intended to, but I’ll bet it’s the best you ever had. So, here’s the finished product; succulent, moist, juicy turkey with all the great flavor added by roasting in the Big Green Egg, and the best tasting gravy you ever had, all enhanced with the addition of the Mad Max Turkey Seasoning. Sometime before Thanksgiving, test out your setup. My first year I found that my roasting pan would not work with the grid on top of inverted plate setter, it was just too high into the dome. I ended up borrowing a rig from Chris Capell that consisted of two metal bars and a pie plate that fit under the grid in its normal place on the fire ring. I kept the pie plate filled with water all day so as to create a good indirect heat barrier from my roasting pan, thereby avoiding any scorching of my drippings (this is key to having the good drippings for gravy). The next year I did a set up of inverted plate setter with the little green BGE ‘feet” on top, and the roasting pan on top of the feet. Key here is to have a heat barrier and sufficient air flow under your roasting pan to avoid any scorching in the pan. I have an 80 year old aluminum oval turkey roasting pan that fits perfectly in a large egg. This time of year, the grocery stores sell all kinds and sizes of metal pans. Figure out what you need to fit in the egg. Other set ups that work include using a ‘spider’ with a pizza stone and then the grid, or the spider/pizza stone with an adjustable rig setting the roasting pan on the bars in their lowest setting. Note, if you are roasting your turkey in the oven, simply put a rack in a low position and put your roasting pan on the rack. I set up as full a load of lump as I could (almost to the top of the fire ring, there was maybe a 1 inch gap between the lump and the bottom of my plate setter). I added one good chunk of apple wood (other good woods are peach and pecan). I didn’t want a ‘smoked’ turkey. When it was done, the turkey had a nice hint of smoke. It’s your call as to how smokey you want yours to taste but remember, a turkey will absorb a lot of smoke, so take it easy. I got a good established fire going at 325°F. I let it burn for about 45 minutes prior to putting the turkey in. I found that a full load of lump at 325°F lasts only about 8 hours, so for a 20+ pound bird, it gets a little close. My turkey weighed in at around 14 pounds. At 325°F it took a good 4 hours to be done. During the cook I regularly basted it with a bulb baster (about once every 20 -30 minutes after the first hour). If using a water pan for a heat barrier regularly check the water pan underneath the roasting pan to insure it stays full of water. When the skin started browning, I tented it loosely with aluminum foil until about the last hour, when I removed the foil to let the skin crisp up and come up to the color I wanted (a nice deep golden brown). I didn’t check temps until the last hour or two. Even then, I pulled the turkey out when two things happened. First, when a deep poke in the thigh and breast resulted in clear juices running, and second, when the drumstick rotated freely at the joint (hey, this is how my mom and Aunt Elsie taught me to do it). So, how do you make great gravy? Its really pretty easy, particularly at this point because you have created all the wonderful ingredients that you really need to do it. Take your pan with all the dripping in it. Note, that dark stuff you see is not burnt. It is well browned and will affect the final color of your gravy, but trust me, this is where all the real flavor is. Note – depending on how dark the drippings end up being will determine how dark your gravy turns out. Sometimes its lighter, sometimes darker. It will be fantastic either way.